Paragon Embedded Telemetry System - Paragon Innovations, Inc. The Paragon Embedded Telemetry System (PETs) is a reference design for the development and deployment of rugged, highly reliable telemetry devices. 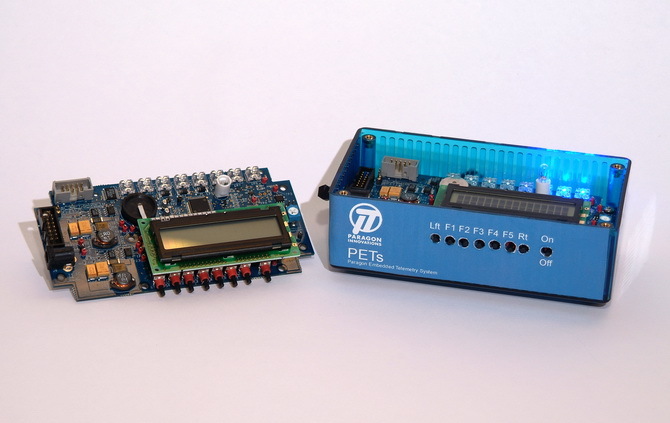 PETs design is a radio/infrastructure independent platform, including digital and analog I/O, local display and local serial communications. The Paragon Embedded Telemetry System (PETs) is a hardware and software reference platform that provides a base platform for developing high reliability, rugged telemetry systems. The PETs Model 1 reference board is shown above. The heart of the PETs concept is radio independence. This gives telemetry systems the ability to work multiple with networks, and gives users negotiating power with potential data carrier services. The ability to quickly adapt to new networks and radios is achieved through Paragon’s proprietary software interface, the Telemetry Abstraction Layer™ (TAL™). The TAL™ provides a consistent and easy to use interface for application software. The TAL™ automatically determines the radio and network connection for the system and automatically adapts the PETs device to operate properly on power up. PETs was designed for low power operation right from the start, making it excellent for battery and solar powered applications in extremely remote areas. Paragon will customize PETs to meet your unique telemetry requirements. Call us for a proposal.